In 1980, Gary Holland graduated from the Wharton School of Finance at the University of Pennsylvania with a Bachelor of Science in Economics and a concentration in International Finance. In 1981 he completed the Credit Training Program at Chase Manhattan Bank Headquarters in New York. From 1981 to 1983 he worked as a Credit Analyst for Chase in New York with several extensive domestic and overseas assignments at each of the following Chase Lending Offices. From 1983 to 1990 he worked for a family related business, Los Angeles based Krupp-Taylor USA the nation’s third largest direct response advertising agency. During this time he also renovated residential real estate in Los Angeles. In 1990 he moved to the Dallas/Fort Worth Metroplex where he returned to his first interest of investing. From 1991 to 1994, he renovated 16 Dallas area houses and apartments as well as served as a mortgage broker. In July 1994 Gary joined the downtown Dallas office of Smith Barney and settled into his current role as an investment advisor. Following nearly 10 years at Smith Barney Gary left in February 2004 and established Holland Investment Management. Gary resides in the Dallas/Fort Worth area where he is very actively involved with raising his daughter. From 1983 to 1987, he worked as an account executive for a supplier to major residential and commercial real estate developers in the DC metropolitan area. In 1987, he moved to Los Angeles and joined Krupp-TaylorUSA, the nation’s third largest direct response advertising agency. It was there that he first worked with Mr. Holland on accounts for the nation’s largest furniture retailer, the third largest warehouse chain which later became part of Walmart as well as some financial institutions. After working with Mr. Holland for two years, he became the lead account supervisor on the account of Signet Bank one of the nation’s largest financial institutions, which later become Capital One. During this time in Los Angeles he also renovated residential real estate, including some projects partnering with Mr. Holland. From 1992 to 2008 Charles became involved again in the real estate business. He set up his own business where he assembled and managed private syndications for the acquisition, renovation and sale of outdated multi-family housing complexes. Mr. Holland was an investor and partner in one of those projects, a 212 unit apartment complex, in Arlington, Texas. From 2009 to 2013, he served as a financial advisor with Valic Financial Advisors. There he was appointed by Memorial Healthcare System and the Palm Beach County School District to assist employees and their families with retirement financial planning and investment management. 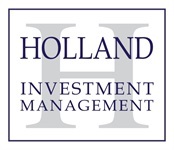 On April 1, 2013, Mr. Johnson was named Director of Client Services and Investment Adviser Representative at Holland Investment Management, Inc.
Charles resides in the Dallas/Fort Worth area with his wife and son.